agreed. if you need a secret place to hole up and drink beer, find somewhere warm. Oh, I feel your pain on this one! I just shared your post on Facebook…this one rings so true for me. This is why I live in Arizona and have a Minnesota calendar with pictures of the seasons on my wall (two actually: one at home and one at work). I enjoy Minnesota through the photographs, here in Sunny AZ. I, too, am a Minnesotan who prefers to stay INDOORS. 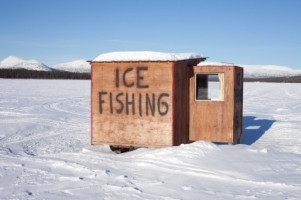 Even scarier than the fish house on the frozen lake is the logic that 'it's warm!' because you put a HEATER inside it. Really?? There are mere inches of ice between you and a cold blue death, and you're gonna put a HEATER on those inches? Duuuude … here's the thing about trucks on the ice … there are people who cut significant time off their commute in the winter by driving the ice roads around Ely. And how else do you rescue your stuck snow machine, or the guy who broke his leg when he hit Deadman's Point with his sled? And hey, think of the good things about cold weather. Like, you leave a go-cup of soda or a water bottle in your car overnight, and it's still good to drink the next day.